Restrictions: For the G3D procedure, the AXIS statement is supported by the JAVA and ActiveX devices only. For the GCHART procedure, the AXIS statement and its options are ignored when used in conjunction with the BLOCK statement. specifies the color for all axis components (the axis line, all tick marks, the frame outline, and all text) unless you include a more explicit AXIS statement color specification. specifies the length of the axis in number of units. suppresses the printing of group brackets drawn around the values on the group axis in a bar chart. removes either the horizontal or vertical three-dimensional axis plane in bar charts produced by the HBAR3D and VBAR3D statements. specifies the x coordinate and the y coordinate of the origin of the axis. offsets the axis values on a horizontal axis. specifies a line type for the axis line. specifies the thickness of the axis line. The INTERVAL option affects the LOGBASE option in the AXIS statement. scales the axis values logarithmically according to the value specified. specifies whether the values displayed on the logarithmic axis are the values of the base or the values of the power. specifies the order in which data values appear on the axis. creates and defines the appearance of a reference-line label. specifies one or more characters that the AXIS statement uses to break axis values into multiple lines. modifies the major tick mark values. modifies the major tick marks. modifies the minor tick marks that appear between major tick marks. specifies the color for all axis components (the axis line, all tick marks, the frame outline, and all text) unless you include a more explicit AXIS statement color specification. The following table lists the SAS/GRAPH statement options that can be used to override the COLOR= specification. The table also lists the name of the style reference associated with each of the options. The INTERVAL option affects the LOGBASE option in the AXIS statement. Specifying the options INTERVAL=UNEVEN and LOGBASE=10 permits non-base-10 values to be specified for the ORDER option, while retaining a logarithmic scale for the axis. Note:PARTIAL is an alias for UNEVEN. They have the same effect. provides up to 256 characters of label text. By default, the text of the axis label is either the variable name or a previously assigned variable label. Enclose each string in quotation marks. Separate multiple strings with blanks. See Text Description Suboptions for a complete description of these suboptions. #BYVAL or #BYVAR substitution in a text string is not available in the DATA Step Graphics Interface or in the Annotate facility. This is because BY lines are not created in a DATA step. specifies the length of the axis in number of units. If you request a length that cannot fit the display, a warning message is written to the log and your graph might produce unexpected results. specifies whether the values displayed on the logarithmic axis are the values of the base or the values of the power. The LOGSTYLE= option is meaningful only when you use the LOGBASE= option. Restrictions:Partially supported by Java and ActiveX. HEIGHT is not supported by Java or ActiveX. WIDTH is not supported by Java. AXIS definitions assigned to the group axis of a block chart ignore MAJOR= because the grid does not use either axes or tick marks. Note:By default, tick marks are placed at three intervals on the spokes of a GRADAR chart. They are placed at the minimum value, maximum value, and at one value in between. The tick marks on the 12 o'clock spoke are also labeled by default. Restrictions:Partially supported by Java and ActiveX. HEIGHT is not supported by Java or ActiveX. AXIS definitions assigned to the group axis of a block chart ignore MINOR= because the grid does not use either axes or tick marks. To remove selected axis elements such as lines, values or labels, use specific AXIS statement options. To remove all axis elements except the three-dimensional planes use the NOAXIS option in the procedure. To remove the three-dimensional back wall, use the NOFRAME option in the procedure. specifies the distance from the first and last major tick marks or bars to the ends of the axis line. The value of (n1) is the distance from the beginning (origin) of the axis line to the first tick mark or middle of the first bar. The value of (n2) is the distance from the end of the axis line to the last tick mark or middle of the last bar. You are able to specify up to 256 characters for each variable value. With SAS date and time values, use a FORMAT statement so that the tick mark values have an understandable form. For more information about SAS date and time values, see the Formats by Category in SAS Formats and Informats: Reference. Using the ORDER= option to specify non-uniform intervals for major tick marks can result in no minor tick marks being drawn. It also generates a warning message in the SAS log. The ORDER= option does not calculate midpoint values. As a result, it is not interchangeable with the MIDPOINTS= option in the GCHART procedure. You can use the ORDER= option to specify the order in which the midpoints are displayed on a chart, but do not use it to calculate midpoint values. Make sure that the values that you specify match the midpoint values that are calculated either by default by the GCHART procedure or by the MIDPOINTS= option. For details, see the description of the MIDPOINTS= option for the appropriate statement in GCHART Procedure. Not valid with the ASCENDING, DESCENDING, and NOZEROS options used with the bar chart statements in the GCHART procedure. Interaction:The ORDER= option overrides the suboption NUMBER= described in Tick Mark Description Suboptions. Note:The ActiveX control supports simple order lists and non-uniform interval values for numerical data and dates. provides up to 256 characters of label text. By default, a reference line does not have a label. Enclose each string in quotation marks. Separate multiple strings with blank spaces. The strings are applied to the reference lines specified by the VREF or HREF option. If the AXIS statement does not encounter a specified split character, no break in the variable value occurs, and no warning or error is issued. The value appears on the axis on one line as December, 1999. However, any other axis values containing a comma honors the split character. Note:The split characters themselves are not displayed. Interactions:In order for the axis line to be altered by the STYLE= option, the NOFRAME option must also be set. If only the STYLE=option is set, the line framing the axis area is modified. provides up to 256 characters of text for the major tick mark value. By default, the value is either the variable value or an associated format value. Enclose each string in quotation marks and separate multiple strings with blanks. Note: Although the VALUE= option changes the text displayed at a major tick mark, it does not affect the actual value represented by the tick mark. To change the tick mark values, use the ORDER= option. Also note that with the Java or ActiveX devices, it is necessary to use the ORDER= option. This ensures that the same number of tick marks are displayed as are with graphics rendered with the other device drivers. For example, specify ORDER=(1 to 12) to ensure that tick marks for all twelve months are displayed. Note: To change the value of midpoints in bar charts produced with the GCHART procedure, use the MIDPOINTS= option in the procedure. For a complete description of these suboptions, see Text Description Suboptions. NOTE: Axis value is specified. RANGE option is ignored. Note:If an end user viewing a graph in the Java applet or ActiveX control zooms in on a particular part of a graph for which the VALUE= option is specified, the values are not readjusted in coordination with the zooming. specifies the angle of the baseline with respect to the horizontal. A positive value for degrees moves the baseline counterclockwise; a negative value moves it clockwise. By default, ANGLE=0 (horizontal) unless the text is automatically angled or rotated to avoid overlapping. Restrictions:You cannot justify angled text that is used to describe tick marks on a horizontal axis; the JUSTIFY= suboption is not honored when the ANGLE= value is anything other than zero. automatically labels each reference line on an axis with the response value at the reference line's position. The AUTOREF suboption is used only with the REFLABEL= option, and can be used in conjunction with the FORMAT= suboption to refine the labels. When the FORMAT= suboption applies a valid format to a response variable value, AUTOREF displays those formatted values as the reference line labels. When the FORMAT= suboption is omitted, AUTOREF displays (as reference line labels) the response variable values as is. Note: If you simultaneously request automatic labeling with a PLOT or BUBBLE statement (using the AUTOHREF or AUTOVREF option), then the automatic labeling can write on top of the custom label that you specified using the AXIS statement. You must ensure that your custom labels specified using the AXIS statement are not at the same position as automatic labels requested with a different statement. If you use a device-resident font for your midpoint axis labels and one or more of the axis labels overlap the legend in your graph, the device-resident font for each label that overlaps the legend is replaced with a SAS/GRAPH font. Since device-resident fonts do not support clipping, a SAS/GRAPH font must be substituted in that case. This includes the axis label and the tick mark labels. An overlap can occur when you use the MODE=PROTECT option on your LEGEND statement with labels on your midpoint axis. To correct an overlap condition, you can use the NOLEGEND option on your plot statement to suppress the legend or you can use the positioning options on your LEGEND statement to reposition the legend. See POSITION=(<BOTTOM | MIDDLE | TOP> <LEFT | CENTER | RIGHT> <OUTSIDE | INSIDE>). specifies a valid format to be applied to the response-axis value shown with the AUTOREF label on each reference line. This suboption allows for the character or numeric formatting of x-axis and y-axis variable values. 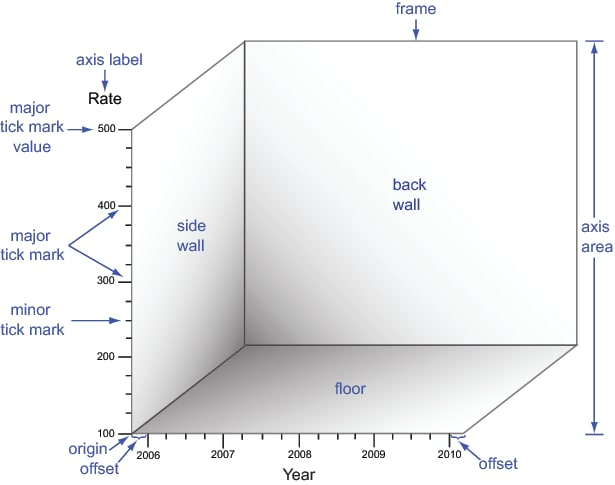 The FORMAT= suboption of the REFLABEL option controls the display of different values at the reference lines relating to conversion rates, scales, and the like. If an invalid format is specified, then a warning message is issued and the resulting labels have response-axis values with no formatting. When FORMAT= is omitted, the default reverts to the AUTOREF suboption behavior of producing labels automatically with unformatted response-axis values. Restrictions:Must be used with the AUTOREF suboption of the REFLABEL option. Formatting might accommodate response-axis variable values that are up to 256 characters in length. Note:Although the AUTOREF suboption ignores any format assigned to an x- or y-axis variable with the FORMAT statement, the FORMAT= suboption provides a way to format each response-axis variable value. specifies the alignment of the text. The default depends on the option with which it is used and the text that it applies to. For a left vertical axis label, the default is JUSTIFY=RIGHT. for a right vertical axis label, the default is JUSTIFY=LEFT. For a reference line that intersects a vertical axis, the default is JUSTIFY=CENTER. RIGHT places the text string on the right end of the line. CENTER places the text string in the middle of the line. LEFT places the text string to the left of the line. For a reference line that intersects a horizontal axis, the default is JUSTIFY=RIGHT for all procedures except the BAR statement in GBARLINE. For the BAR statement in GBARLINE the default is JUSTIFY=LEFT. RIGHT places the text string just to the right of the line. CENTER centers the text string on top of the line. LEFT places the text string just to the left of the line. For numeric variables on a vertical axis, the default is JUSTIFY=LEFT, starting with SAS/GRAPH release 9.2. Specify JUSTIFY=RIGHT to align the variable values according to release 9.1 and earlier behavior. For character variables on a vertical axis, the default is JUSTIFY=LEFT. Restrictions:You cannot justify angled or rotated text that is used to describe tick marks on a horizontal axis; the JUSTIFY= suboption is not honored. Note:With output using Java and ActiveX, text justification is relative to the text string, not the tick mark. For example, left justification means that the left end of the text string is justified with respect to the drawing location, as well as other strings in a multiline label. Because the text is left-justified with respect to the drawing location and not the tick mark, the text string can be placed to the right of a tick mark. For horizontal reference lines, TOP places the label just above the reference line. MIDDLE places the label on the reference line. BOTTOM places the label just below the reference line. For vertical reference lines, TOP places the label at the top end of the reference line. MIDDLE places the label in the middle of the line. BOTTOM places the label at the bottom end of the line. Restrictions:You cannot justify angled text that is used to describe tick marks on a horizontal axis; the JUSTIFY= suboption is not honored when the ROTATE= value is anything other than zero. Note:The Java and ActiveX device drivers do not support the REFLABEL option. FONT=SWISS applies to both Weight and (in tons). HEIGHT=4 affects Weight, but is respecified as HEIGHT=3 for (in tons). JUSTIFY=RIGHT affects only (in tons).